'Such brutality - and no condemnation from the Palestinian Authority,' wrote US Ambassador to Israel David Friedman. 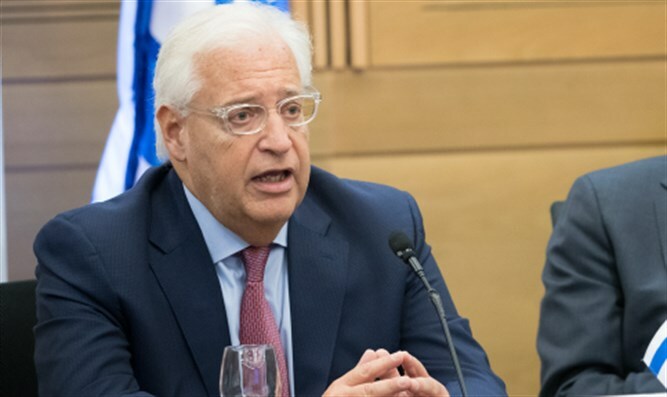 US Ambassador to Israel David Friedman slammed the Palestinian Authority Monday for its failure to condemn a string of deadly terror attacks that took the lives of three Israelis since Friday afternoon. On Friday, an Arab terrorist ran down and killed two Israeli soldiers in northern Samaria, and injured two more. The murdered soldiers were identified as Captain Ziv Deus, 21, from the Azor Regional Council, and Sergeant Netanal Kahalani, 20, from the town of Eliakim. A third Israeli was murdered in a stabbing attack Sunday afternoon, when 28-year-old Abed al-Rahman Bani Fa’adal, a resident of the Palestinian Authority-controlled town of Aqraba, repeatedly stabbed 32-year-old Adiel Kolman, a father of four from the town of Kochav Hashahar. In a Twitter comment Monday, David Friedman mourned the three murdered terror victims, and ripped the Palestinian Authority for failing to condemn the attacks. Kolman’s remains were brought to the Kochav Hashahar cemetery on Monday, where hundreds of mourners paid their final respects.